Every discovery of prehistoric art, regardless of its inherent significance, must be authenticated. Almost immediately after the discoverers of the Chauvet Cave announced their find, a “verification visit” was organized. It was conducted on 29 December 1994 by Jean Clottes, an expert on Paleolithic art, guided by the discoverers. Examination with a magnifying glass revealed that the apparently continuous lines of painted silhouettes actually had a number of tiny missing portions that were worn away by erosion. Usually, a younger line is less broken, more uniform. 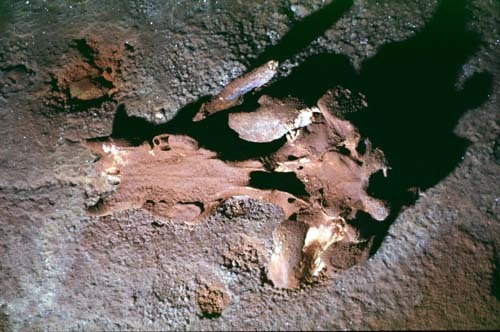 Cave bear’s skull, in a secondary position on a carbonated floor in the deep part of the cave. Tall adult. Likewise, after being subjected to the cave’s atmosphere for thousands of years, the inside surfaces of engravings, which are clean, white, and neat when freshly made, were filled with microscopic crystallisations. In view of the excellence of their execution, particularly their naturalism, the representations of animals were above suspicion. A counterfeiter would have had to synthesize the skill of an accomplished animal painter with expert knowledge both of the features of Paleolithic art, and the physiology of indigenous animals of that particular era. Finally, the characteristics of the ground made the idea of a fraud implausible. It was littered with the bones of cave bears. Dozens of skulls could be seen, and nothing had been disturbed. Consequently, it was resolved that the art in the Chauvet Cave was, without the shadow of a doubt, authentic. Example of cave bear’s footprints on an clayey floor in the deep part of the cave. 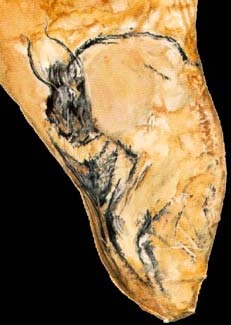 In the Chauvet Cave, traces of cave bears are ubiquitous. Their bones are often scattered, sometimes piled up, and were either thus arranged by humans, dispersed by the movements of the bears themselves or else displaced by the encroachment of water. Some of the skeletons are relatively well preserved, with their spines connected in anatomical accuracy. Several dozen skulls were likewise found. The bears left behind a number of lairs, which are often marked by traces of their talons or fur. On the loose ground, one can see remarkably distinct imprinted tread marks. The walls are strewn with scratchmarks, and covered with prehistoric paintings and engravings. The candle gallery : floor brazier with carbonated deposit on a clayey floor. Traces of human beings are less frequent, doubtless because the intrusion of water has erased the majority of them in the individual sectors of the underground chamber. Still, about a dozen flintstones were found, as well as the remains of torches that were used to illuminate the interior and several remains of campfires. In May 1999 human footprints discovered by J-M Chauvet were authenticated by Michel Garcia (CNRS). They belong to an 8 to 10 year old boy. They are the earliest known Homo Sapiens footprints in Europe up till now, and show that children had access to the deep galleries of decorated caves during the Upper Paleolithic. As in all ornamented Paleolithic caves, the subjects of paintings and engravings are primarily geometric symbols and animals. In the Chauvet Cave, geometric symbols appear more abundantly than in any of the other grottos of the Ardèche, although there are relatively few compared to caves in the Pyrenees, the Périgord or the Cantabrian region of Spain. For instance, there are some large red dots. A few of them are separate, others mark the borders of particular red panels, such as that of a panther. The most recurrent representation is that of an arrangement of dots of large diameter (six to eight cm). The panels with big red dots strongly resemble those found at Pech-Merle in the Lot. The studies carried out in 1998 (D. Baffier et V. Feruglio) have shown that they have been done with the palm of hand smeared with paint. They are positive hands. Yellow Horses Panel, red dots The studies carried out in 1998 (D. Baffier et V. Feruglio) showed that the stencils were made by smearing the palm of the hand with paint. They are, therefore, positive imprints. “Positive hand imprints” which, contrary to “negative hand imprints”, were thought to be rare in Paleolithic art, were one of the main discoveries of the 1988 mission. The most remarkable symbols look like butterflies or headless birds with over-sized wings, or else resemble other insects. Panel of the lion, south part, detail – The line of the four big lions is superimposed with prior representations . The subject in the background, removed by scraping, is only represented by the beginning of the line of its back, its ear and its forehead. Notice, on the other animals, the use of a stump and the implanting of the whiskers. We can notice on the right a reindeer with multiple paws. In the foreground, the engravings with fine lines correspond to bears’ scratches ; the overabundance of scratches demonstrates the contemporary settlement of man and hibernating animals in the cave. (L. 0,80 m.) . There are a great many animals represented, between 400 and around 500, in total. To date, we have counted about 400 animals, and we are continually finding more. Mammoths are the predominant animals, followed by rhinoceroses. Rhinoceroses have several traits in common, that make them look remarkably similar. All have distinctive ears, formed by a double arc, which look like small wings on either side of the cranial- dorsal line, spherical paws, and a large black stripe in the middle that divides the body centrally. Lions are as numerous as rhinoceroses. None have the mane we customarily associate with the African male lion; doubtless, the cave lions, like other felines, had no such attribute. The large red spots studied by Valérie Féruglio and Dominique Baffier were positive handprints. The palm of hand was smeared with paint and pressed against the wall. Panel of the panther – In the foreground, speckled fur and animal’s head compared with a hyena or a bear. In the background, representation of the feline with a spotted fur : observe the typical tail (approximate L. : 1 m.). These representations are part of a huge panel (about 3×3 m.) which includes a bear, an ibex and other red lines. The horses and bisons, bears, reindeer, aurochs, and ibexes are less numerous. In addition, there are three megaloceros, one red deer, and one panther. The panther here is the only image we know of that animal in Paleolithic art, and the same goes for an engraved owl. One animal portrayed is possibly a hyena, and several dozens of animals are unidentified. Compound entity, half man, half bison. As of today, no human likeness has been discovered. 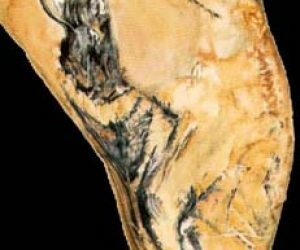 What was found in the cave were tracings of body-parts (negative and positive hands, three vulvas), and one compound entity, half man, half bison. Galore thanks for making the travail to treat this, I appear strongly some this and suchlike studying a large pot many on this matter. If practical, as you realise knowledge, would you listen updating your webpage with a large wad more substance? It’s really healthful for me.